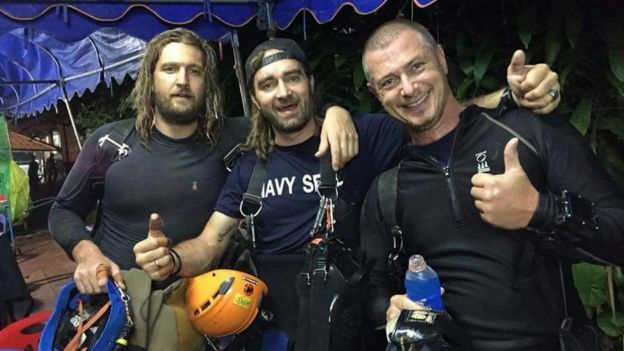 The rescuers who worked to save the group trapped in a Thai cave were a mix of international divers collaborating with Thai navy Seals. The 12 boys and their football coach were first found by British divers but the effort to get them out was a truly global operation. Several Thai navy divers took part in the rescue. One ex-navy diver, Saman Gunan, died in the cave last Friday. Little information has been released about exactly who was involved and how, largely because most participants have been reluctant to talk. Briton John Volanthen’s voice was the first the boys and their coach heard after nine days trapped underground. 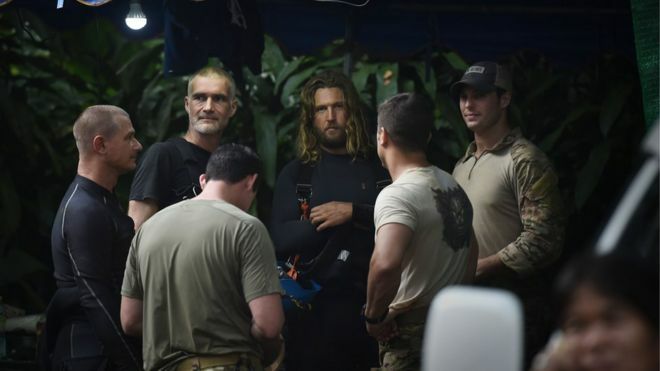 He and fellow British diver Mr Stanton were called in by Thai authorities, along with another British caving expert, Robert Harper. The trio arrived in Thailand three days after the football team went missing. 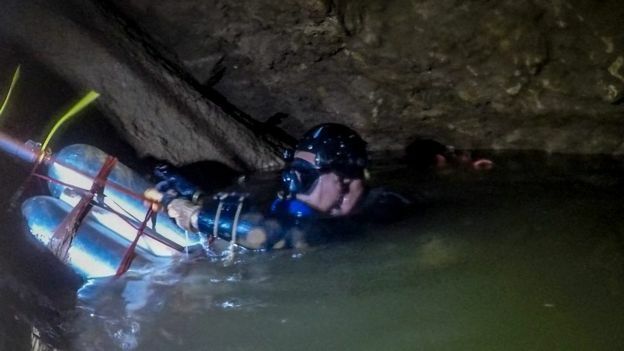 Mr Volanthen, an IT consultant, and Mr Stanton, a former firefighter, are part of the South and Mid Wales Cave Rescue Team. 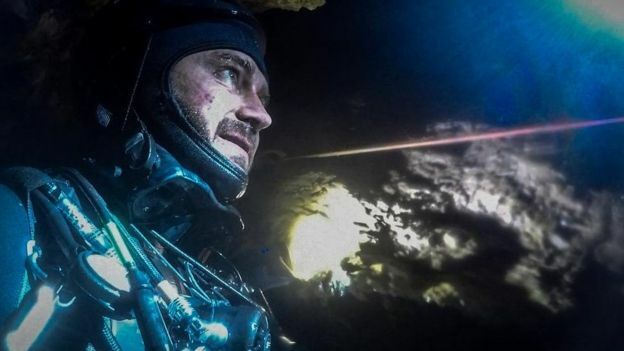 They have participated in a number of cave diving rescue operations, including in Norway, France and Mexico. Dr Harris, from Adelaide in Australia, has decades of diving experience. He was the one who examined the boys in the cave and gave the green light so the rescue operation could go ahead. Had the boys been too weak, a rescue attempt by diving out would have been too dangerous. According to media reports, Dr Harris has taken part in cave diving explorations in Australia, China, the Christmas Islands and New Zealand. A anaesthetist by training, he has also been specialising in expedition medicine and retrieval operations. In 2011, he recovered the body of his friend, experienced cave diver Agnes Milowka, who ran out of air during an extremely difficult expedition in South Australia. It is thought that his assistance in the Thai rescue was specifically requested by the British divers. Numerous Thai special forces were part of the rescue efforts. Most notable are a doctor – widely identified as Pak Loharnshoon – and three yet-to-be-named divers who volunteered to stay by the boys’ side after they were found underground a week ago. Dr Pak is seen applying medicine to a boy’s minor wounds in a video shared by the Thai navy Seals Facebook page last week. Four Thai Navy Seals personnel were the last to leave the cave on Tuesday evening. 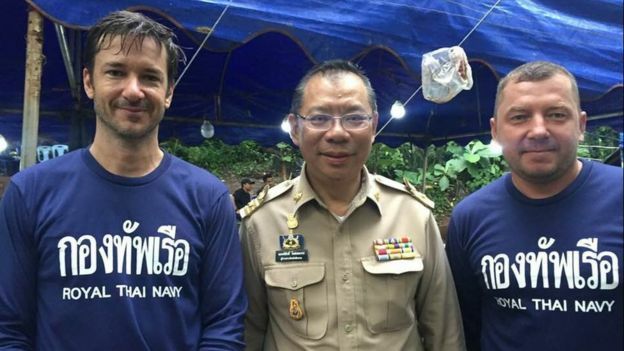 Petty Officer Saman Gunan, 38, was a retired Thai navy diver who volunteered in the rescue efforts. He lost consciousness on his way out of the Tham Luang cave complex, where he had been delivering air tanks on 6 July. His dive partner tried to revive him but could not, and his body was brought out of the cave. Belgian Ben Reymenants runs a dive shop in Phuket. He is thought to be part of the group that first found the boys on the Monday. Claus Rasmussen is a Danish national who has been living for years in Thailand, working for several different dive schools. He is currently an instructor working with Ben Reymenants’ company, Blue Label Diving. He has been diving across Asia and also worked in several other countries in South East Asia. Finnish national Mikko Paasi is the founder of a diving centre on the small Thai island of Koh Tao, where he specialises in technical diving. That means he focuses on wreck and cave diving. On 2 July, the day the boys and their coach were found, Mikko’s wife said on Facebook she bought her husband’s flight to Chiang Rai to join the rescue efforts on what was their eighth wedding anniversary. Ivan Karadzic, a Dane, moved to Koh Tao a few years after Mr Paasi, and they now run the diving centre together. He told the BBC about his fear on seeing the first boy and a diver approach him from a distance – not knowing if it was a “casualty or kid” – and then his relief on realising the boy was safe. Canadian national Erik Brown is a technical diving instructor from Vancouver. He began diving over a decade ago and co-founded Team Blue Immersion, a technical diving school in Egypt. 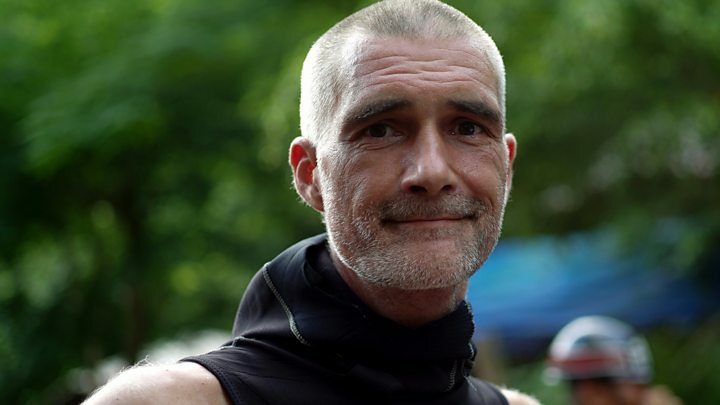 On Tuesday night, he wrote on Facebook that he had done seven diving missions in nine days, which accumulated to 63 hours inside the Tham Luang caves. 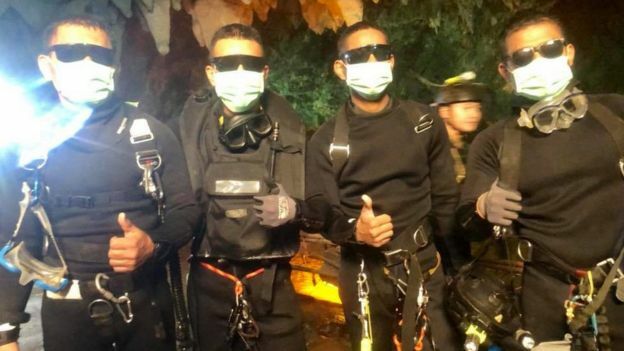 May the Triple Gems Bless all those selfless Divers from Thailand and abroad for their heroic work in rescuing the 12 boys and their Football Coach. May the Triple Gems Bless the boys, their coach and all those people near and far who extended support in everyway possible to make this near disaster not a tragedy. May the heroic Thai Navy Seal Saman Gunan who so selflessly sacrificed his life in the noble attempt to rescue the stranded attain the Supreme Bliss of Nibbana!